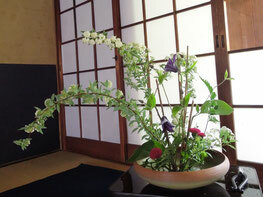 Ikebana is the Japanese art of flower arrangement. This traditional and formal art may seem esoteric, but this is not the case. Anyone is capable of creating a fantastic work of art by themselves after acquiring the basic concepts and fundamental skills of this art. 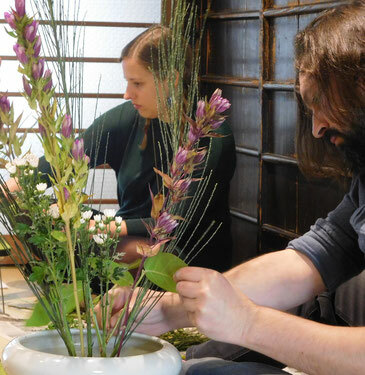 Learning ikebana promotes a better understanding of the Japanese view of nature; a crucial step in appreciating the unique aesthetics, emotions and thoughts that merge to create this visual art form. 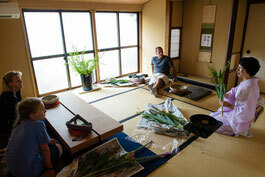 Flower arranging used to be a required "mannerism" for well-educated men, such as samurais or monks. Since you have travelled to this "strange island" it would be a waste not to experience our genuinely unique culture! 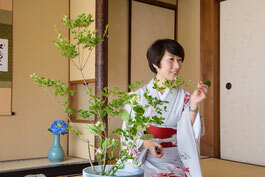 Introduction of essential knowledge about ikebana, its history and background. By watching the instruction, you will learn the basic concepts, allowing you to grasp an image for your own work. 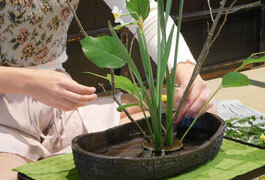 Try to create an ikebana art work yourself! We'll give you a hand when you need it. Please make your online reservation by 5:00pm on the day before your booking. For a Monday class, please make your online reservation by 5:00pm on the previous Saturday since our facility is closed on Sunday. Please arrive on time as the ending time for each workshop is fixed. We accept Japanese yen and credit cards. We don't accept checks. The same schedule as our hands-on course, but the duration is 45 minutes. This course is for a group of at least 2 people. This lesson is for a group of at least 2 people. We willingly accept large groups and will do our best to respond quickly to your request. 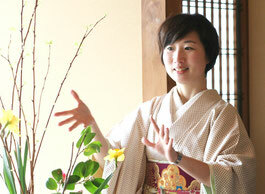 I've studied and practiced ikebana for 16 years. I started learning this traditional art being influenced by my mother and aunt who are also ikebana masters. 100% of the fee will be charged for cancellation on the day before, the appointed day, or for any "no-shows".